Adobe's Photoshop has been the single real option in bitmap image editing since early nineties, but now there are some good competitors if you need to edit bitmap images such as photos, collages or paintings. There were some graphics programs before too, but it was hard to recommend them to anyone. They either were too specific for a narrow purpose or simply not good. Then things started to change, slowly. Let’s look at the mac side of things for now. Pixelmator was one of the first attempts. It was much cheaper, it was very fast, and had many basic features. It was possible to use it as a basic editor, but for me the interface is the weak part. It all comes down to moments when I am using a mac that has Pixelmator and I need to edit some images, I often would hesitate and eventually will have to switch computers because the other one has Photoshop installed. That is my personal metric – how much I try to avoid using a particular tool. If I do, then the tool is not good enough. So even though I was always trying other editors I was getting back to Adobe tools. The first real switch came with Sketch from Bohemian Software. I used to do all interface and design things in Photoshop and Illustrator and then boom, no more. Sketch was better, faster, lighter and at the beginning even cheaper much cheaper. It totally took care of all UI design imaging needs for me and I use it a lot today. But Sketch is a vector image editor and I still need a bitmap image editor. Then I found Affinity Photo by Serif. Also at exactly the same time Acorn by Flying Meat released a new version and I gave it a shot. Finally there were interesting options. Affinity Photo is a real deal, full-featured alternative to Adobe Photoshop. It's totally on par with features, few things are not as good, but many features are done even better. If you edit photos all the time, create digital paintings Affinity Photo is a great editor, and it's mature enough that it can be the go to app. And it is much cheaper than stuff from Adobe. You can buy it from the Mac App Store, pay once and install it on all your computers that are connected to the account. They even came up with version for iPad that is just as good as mac version. I am very happy with it. Yet for me it still feels a bit too new and because of that I found that sometimes for me it's easier to use Acorn. Version 6 is very well done, long time Photoshop users will find it very familiar and easy to use. It's fast and great for all kind of small edits. In a way if you don't need sophisticated color adjustments and complex manipulations the tools are even easier to use than Affinity Photo, but for my needs Acorn has a big shortcoming - very poor image export format choice. Because of that I often just can’t use it. 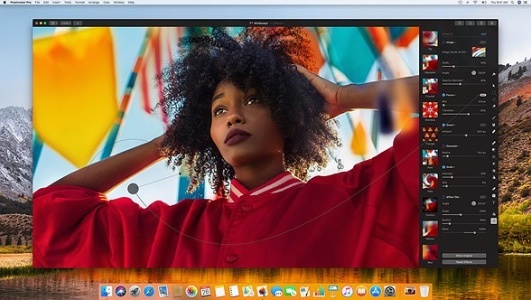 Affinity Photo has a competitor too, Luminar from MacPhun. In a way those two are more alike to each other then to Photoshop, Acorn and Pixelmator. Yet while they are more similar and comparable for photo editing, but when it comes to paining I find Affinity Photo is noticeably better. Now we have one more contender for the Photoshop replacement crown. Pixelmator Pro. It's too new for me to really judge it, but from the description and initial impressions it seems to be a strong competitor to both Affinity Photo and Photoshop. I am sure that in the beginning there will be few rough edges but I hope they will be polished pretty soon. Thus it's great news for users. Lack of real competition stagnated Adobe for a long time and now they will start to improve faster and in more ways than before. Adobe has very strong selection of tools, Photoshop, Illustrator, XD and many many others, they offer it as part of Creative Cloud suite or one by one. All of them are high quality tools, but for me Adobe offering has few down sides: The price of the subscription is a huge thing that always in the air. The other thing that really alienated me was the way the handled the cancellation. I was a subscriber for many years and one day I though I am not using it a lot, I have old versions why don't I just cancel it for a while and see how it goes. But it turned out not that easy. My subscription was annual but was paid monthly, and had auto-renew. Combination of those two settings made me unaware that if I want to cancel and not lose money I have to do it exactly on a particular day. Adobe was happy to inform me that I will have to pay $300 just to cancel. That moment it was clear – subscription model, especially the way Adobe chosen to use it does not work for me. But that is for Creative Cloud. I still have purchased Creative Suite version and luckily it still works. So I actually sometimes use it. Affinity Photo is great editor, has Windows and iPad versions, has vector counter part Affinity Designer (there are even some promises of DTP Publisher), a downside for me is the learning curve, I still have to look up and investigate how to do certain things. Current version 1.6* is an improvement and they seem to continue working hard. Serif also offers lots of great tutorials. Acorn 6 is great lightweight tool, but lack of image format support and few other missing features makes it hard to use as a full replacement. Pixelmator is nice little tool, if you don't have other editors it's possible to use it and get things done, it can even edit vector images too. But interface is lame. That is addressed with Pixelmator Pro. I got it, I will be trying to use it too, let's see how it goes, I think they have good ideas about UI and some of them will be even adopted by others.